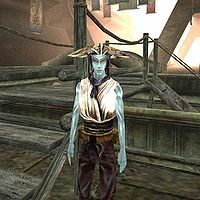 Dalse Adren is a Dunmer gondolier, whose gondola can be found docked beside Vivec's Arena Canton. From there, she can provide you transport to the Hlaalu, Foreign Quarter, Telvanni, and Temple Cantons, though you may still find it quicker to walk between Cantons. Dalse wears a gondolier shirt with a matching helm, common pants, and common shoes. She carries an iron dagger and 20 gold. Aside from her natural resistance to fire and the sanctuary provided by her ancestors, she knows no spells. "I can carry you by gondola to the Foreign Quarter in the north, to the Temple district to the south, to Hlaalu Compound to the west, or to Telvanni Compound to the east." This page was last modified on 31 January 2018, at 14:18.